Nice... not really. Practical... yes. Cost effective... yes. Gravel sites, dirt road. LOTS of mud and ruts. Almost impossible with a 40ft rig to make immediate left turn onto road after coming through gate. Camp host, Nathan, very helpful and keeps grounds as nice as he can with what little he has to do it with I'm sure. Full h/u. Sewer sets to rear. We reached it with 2 sections, but 3 would be better. Lots of mud. Old sites, not well maintained as far as amenities go, but tidy thanks to Nathan. Noisy. Lots of traffic near by. Lots of stores, food near by. 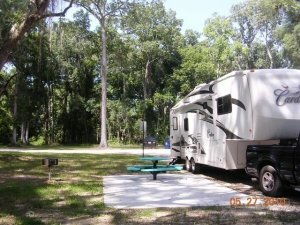 PX/comm accessible, 20 min from campsite. Typical old run down Army outdoor rec. Easy check in. No bath house. Laundry on post, not on site. Easy access to Local sites. Great for cost effective short stay. Ample cell coverage for ATT.